These and many other symptoms can be indications of a system overloaded by toxins from a stressful lifestyle and polluted environment. If left in our systems over time, these toxins can lead to degenerative disease. THE DETOX PATCH: This 'Reservoir Patch' allows active ingredients to be released into the body over time and any body toxins to be absorbed into the patch through a proprietary process known as 'Patchmosis". The skin is the largest organ of the body and is designed to absorb natural substances as well as eliminate toxins. The pads contain natural ingredients that draw toxins from thousands of pores at acupuncture points on the feet. Sweat acts as the body's cleanser and helps in this elimination process. According to Chinese medical knowledge, human body has over 360 acupuncture points, with more than 60 acupuncture points found on the sole of each foot. Blood and lymphatic fluids circulate in the body, a lot of toxins goes with it. 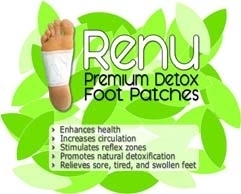 Once it reaches he sole of the foot - Foot Patch sachet can absorb toxins via acupuncture points. The Foot Patch comes in a white sachet that is applied to the soles of the feet and kept overnight. After only one night of body detox, there may be significant changes to the smell and color of the sachet (from dark brown or grayish black) - it reflects the amount and degree of toxins extracted. With continuous usage, (anywhere from few days to few months) it will be visible reduction in the colour and the odor of the sachet. Eucalyptus wood vinegar - known to have strong anti-viral properties and to strengthen the nervouse system. Agaricus Mushrooms - Contain beta-glucan polysaccharides to help improve the flow of the lymph system and boosts the immune system. Peppermint - Provides a mild/heat sensation to help induce sweating, increase circulation, helps induce restful sleep and gives the patch a fresh clean scent. Tourmaline - Naturally emits far-infrared rays and negative ions to help increase circulation.